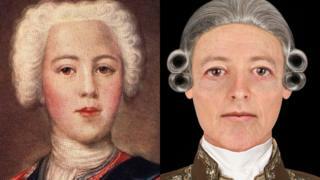 A digital facial depiction of Bonnie Prince Charlie has been created using a death mask made of the prince after he died in 1788 aged 67. Prince Charles Edward Stuart sought to regain the Great British throne for his father in the Jacobite Rising of 1745. His army was defeated by government forces at the Battle of Culloden, near Inverness, on 16 April 1746. He has been celebrated in literature and art as a handsome charmer, but the new image portrays him as an older man. The prince died in Palazzo Muti, Rome. The death mask used by forensic artist Hew Morrison is held in the collection at High Life Highland's Inverness Museum and Art Gallery. Death masks are a likeness of a person, often created from a cast of plaster or wax of the person's face. Famous death masks include those of composer Ludwig van Beethoven, French military leader Napoleon Bonaparte and mathematician Sir Isaac Newton. The new digital depiction of Bonnie Prince Charlie has been put on display at the Inverness museum. Mr Morrison, who usually creates his images from skulls, researched other copies of the prince's death mask, as well as painted portraits and written histories. He said: "There are several known copies of Charles Edward Stuart's death mask in museums and private collections within the UK, some of which show slight differences to the appearance of the bridge and tip of the nose. "Upon first seeing the mask that is held in Inverness Museum and Art Gallery, I was not aware of this variation in different copies of the mask and had considered it to be perhaps down to Charles Edward Stuart having had a crooked nose in life. "It would seem most likely that when different casts of the face were made throughout time, the nose, which is the most protruding area of the face, shifted slightly during the casting process causing the crooked appearance. "After doing some research, I discovered that Lochaber Museum in Fort William also holds a copy of the mask, but the nose on this copy has a straight nasal bridge and undamaged tip. "I went to the museum and photographed their mask to scale, and then superimposed the nasal area over the scaled photograph of the Inverness Museum copy." The forensic artist said that working on the project had been a great opportunity to recreate the face of a highly significant individual from Scottish history. "As the work progressed, what was revealed was the face of a curious, strong, but heavily burdened character." Mr Morrison's other work has included a digital depiction of Ava, a woman who died in the Scottish Highlands more than 4,250 years ago. A spokesman for High Life Highland said: "Prince Charles Edward Stuart's image has appeared on everything from oil painting to shortbread tins, but there are only a handful of portraits which he was known to have sat for. "Artists of the time often sought to flatter and produced portraits that conformed to ideals of contemporary beauty, a precursor to today's photo filters. "The use of imagery as a propaganda tool to promote the Stuart claim to the throne sees a myriad of symbolism and hidden meaning conveyed in every aspect of portraiture. "A portrait may not simply reflect a physical likeness of a person but also their politics, allegiances, wealth or even the image of what a King should look like. "With this in mind, can we really be sure that these portraits are a true likeness of the prince?"